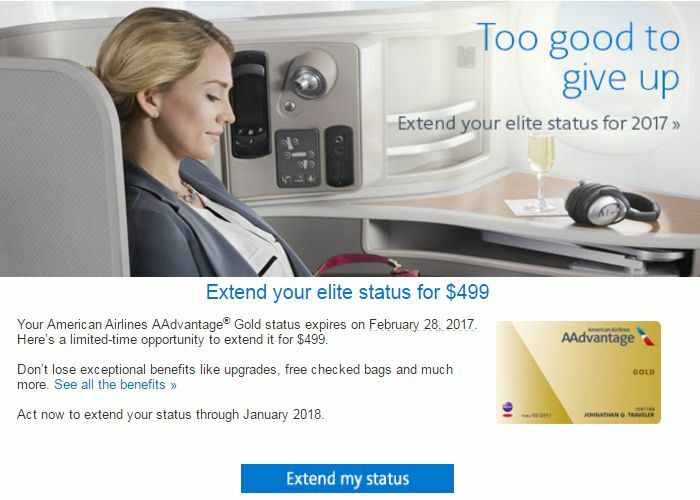 If you have American Airlines elite status for 2016 and haven’t re-qualified for 2017, you likely got an email yesterday offering to let you “extend your status through January 2018.” Or, if you’re just shy of qualifying for the next level of status, you probably received an offer to “boost” your status. Each AAdvantage member’s offer is going to be unique — so, check your email for the details of your offer. 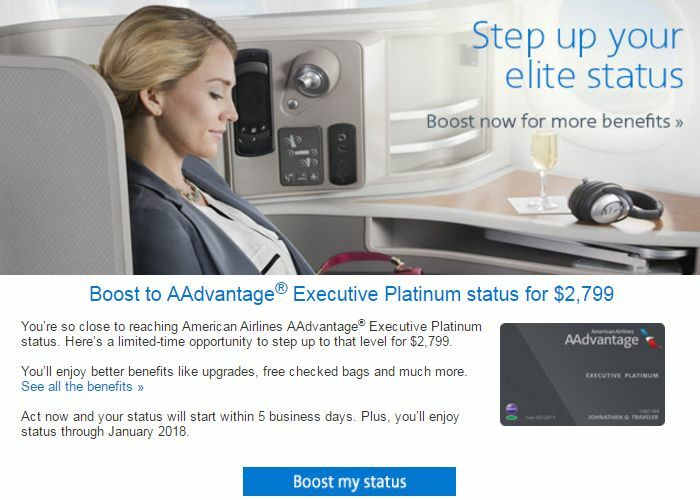 If you didn’t get an email, you can log into American Airlines’ elite renewal page to see your offer. One offer to extend AAdvantage Gold status for $499. Unlike other times when the airline has given away status, these offers come with a price. So is it worth it in this case? That’s all going to depend on your traveling patterns and how much benefit you’d get out of the elite status. In February, we released a general valuation of American Airlines elite status levels for 2016. Since then, the elite benefits haven’t changed, except for the switch to a revenue-based program. However, in practice, the value of upgrades at each level should be greatly discounted due to recent changes of when and how American processes domestic upgrades. Even though the email says that it’s a “limited-time opportunity,” there’s no hurry to make a decision. Your current elite status is good through February 28, 2017, so you still have more than three months to enjoy it. Plus, even if you let your status lapse next March, you have until July 31, 2017 to accept this offer. For nearly $2,800, AA is offering this member a chance to boost his status to a level he will earn soon anyway. Note that you might have received an email even if you’ve got enough flights booked to qualify (or re-qualify). So, make sure to check your current elite-qualifying miles (EQMs) and/or elite-qualifying segments (EQSs) and your upcoming travel plans before considering accepting your offer. American Airlines prices these offers so high that they rarely make sense for most travelers. If you’re just shy of qualifying for a level or re-qualifying for the same level, make sure you’d get enough extra value out of the next status to make it worth paying for it. And consider a cheap trip to earn the miles rather than just paying for the status. What was your extend or boost offer?